Nutritionists specialists agree that it is beneficial to the human body consumption of nuts and seeds. And yet most people rarely indulges. A good way to increase your intake of beneficial unsaturated fatty acids from these fruits is the use of extra virgin oils. 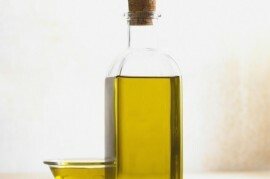 When pressing from the seeds of cold oil will remain all the healthy substances. Therefore these oils are also suitable as part of a healthy diet, such as gall. Some extra virgin oils are suitable for the prevention of cardiovascular diseases. Now, according to the Institute of Health Information and Statistics of the Czech Republic for several years the most common cause of death Czechs. If you are among the lovers of Asian cuisine, not in your pantry miss sesame oil, which is part of the original recipes for exotic dishes. Unlike most other oils can also be used when cooking dishes and a number of beneficial health effects. Often used in gall bladder diet. Essential fatty acids it contains are a good prevention of gallstones. They are the cause of 90% of gallbladder inflammation, and women suffer from these difficulties three times more often than men. Generally, gallbladder problems relate particularly in overweight adults, athlete peers and consume a lot of animal fats. Sesame oil can be successfully used also in liver diet that is very similar to the gall. If people want to take advantage of all the health benefits that brings this oil consumption, they should beware of goods from stores with exotic food. "Manufacturers from Asia often used for pressing přepražená seeds, which have a more pronounced flavor. Oil and loses all but the active ingredient, "said Daniel Vlcek Czech firm Bohemia Oil, which produces organic virgin cold-pressed oils. The company recently produces sesame oil and roasted seeds used exclusively white list. "An hour later, our press can handle compressed into 8 kilo sesame. Mechanical pressing, the raw material is heated up to 40 degrees, and therefore the product meets the criteria for designation of extra virgin. At higher temperatures would result in the loss of nutrients, "said Vlcek. Czech favorite with sunflower oil. The research Jarmila Hamerské, who led at Masaryk University, revealed that he prefers the warm kitchen 43% of respondents. On frying, however, actually it is not suitable, already at 180 ° C begins přepalovat. Better is to use it for example to flavor salads, and is particularly suitable in the diet, which helps in preventing cardiovascular diseases. It contains a high proportion of omega-6 unsaturated fatty acids of all fatty acid lowers the cholesterol level. For problems with the heart's need to watch out for amounts received in total fat and calories. For example, in one tablespoon of sunflower oil has 62 calories in a tablespoon of rapeseed oil is 99 calories. Regarding the energy value of foods, it is important to realize that much better are natural foods with nutrients than the so-called "empty" calories. You are part of industrially formulated products. It is therefore appropriate to resort to extra virgin oils. The sunflower lasts as sesame, hemp 9 months. Storing in the refrigerator shelf life extended. The old oil people know particularly by bitter flavor. On the contrary, failure is not haze on the bottom. It's a sign that the substance has been chemically refined. Hemp seeds are among the so-called superpotravinám, hemp oil and therefore is considered the healthiest of vegetable oils. Under this designation is due to the high content of omega 3 and omega 6 fatty acids. These essential fatty acids the body can not produce itself and you must receive them from food. Particularly important is the intake of omega 3 fatty acids. Scientists study published in the European Journal of Clinical Nutrition showed that a daily intake of this substance is insufficient. Men in France and Greece had consumed 0.6 grams, while Icelanders take 2.5 grams. The recommended daily dose is 1-4 grams. Hemp oil is appropriate to include in the diet as part of a supportive diet to boost immunity and in wound healing. It has anti-inflammatory effects and is an essential component of cell membranes. People do not worry about the use of hemp oil contains no psychoactive substances. The fact that this oil has found the way to consumers, confirms the fact that the company Bohemia The oil belongs to the best-selling. "Annually, it sells 500 liters. People often use one tablespoon of fasting in the morning. Hemp oil is not distinctive taste, but perfectly strengthens immunity, "advised Daniel Vlcek. Repay the loan in cash? You pay twice. Musical event this autumn! Spiritual Quintet with Peck, legs and Hradišťan. I was less than classmates. Help me!